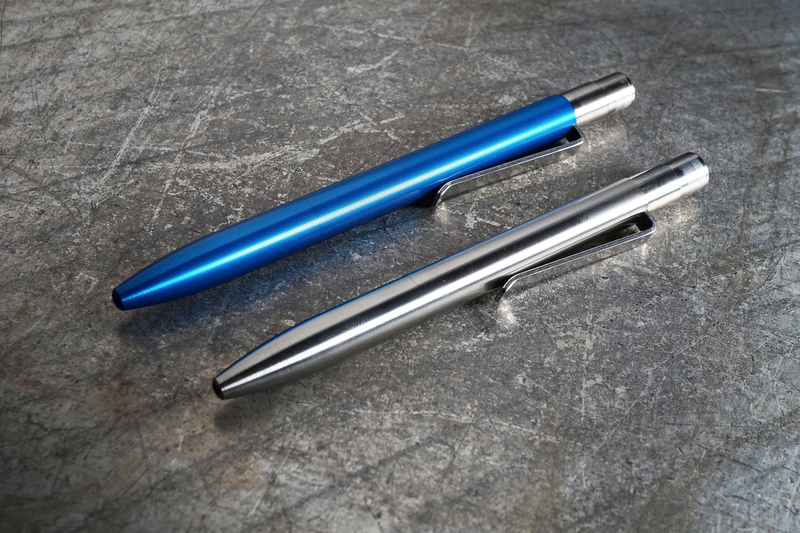 The machined pen world has seen the rise of a few key names over the last five years, and Will Hodges from Tactile Turn is one of them. With 7 successful Kickstarter projects (now on his 8th), Will has created products and designs that seem to resonate with consumers which has spurred a tremendous amount of growth and success for his company. When I say "company", I mean it is actually Will and likely a couple of shop helpers to keep things running, but a small outfit nonetheless. That is one of my favorite aspects of the small makers; that they can produce awesome goods without the need of a big company infrastructure. About 3 and a half years ago, Will launched a campaign for his second pen designs called the Mover and Shaker series. 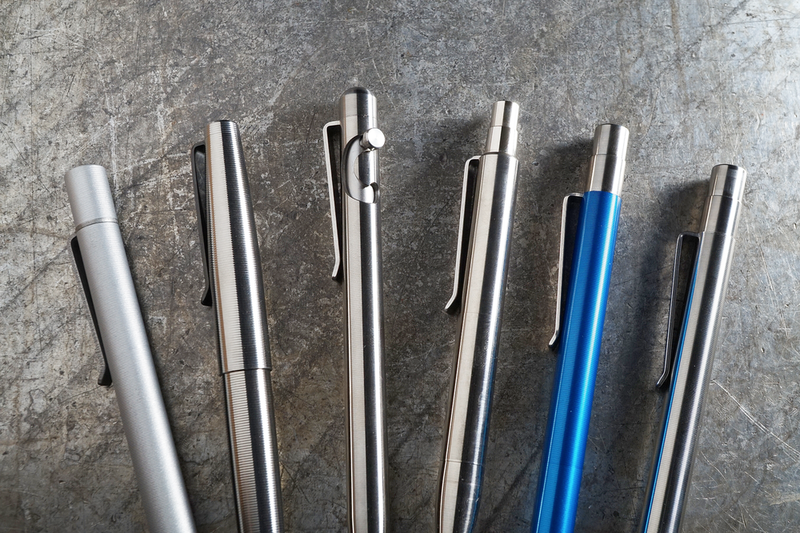 A set of retractable pens that could accept either a Parker style refill or Pilot G2 sized depending on your preference. The original Mover and Shaker pens had a fairly simple, cylindrical design except for a small section in the grip that had a spiral texture. The retractable mechanism Will leveraged is one that several machined pen manufacturers have used that was made by Schmidt. The new mechanism is very similar in style to the Schmidt being two overlapping metal sleeves, but the different is in size. It is probably close to 3x the size as the original which does change the overall aesthetic of the pen. When comparing the utility of the new mechanism over the old, they feel pretty similar to me (of course, a Schmidt that is in full working order), so if you're familiar with the original Mover and Shaker, the experience isn't that far off. These mechanisms don't really have your standard "click" feel to them, but are more of a press. There is no obvious snapping into place or popping like you find in some pens, but more of a press and it engages. Being raw titanium and with the sleeves being really tight in tolerance, I have noticed some wear on the mechanism's top section, which is occurring from the parts rubbing up against each other. I'm not sure if there is anything that can prevent something like this, but something to be aware of long term. Without any adjustment to the design I'm pretty confident that the mechanism will last forever, but may not LOOK the same forever, even without abuse. With the mechanism being wider in diameter, one of the major aesthetic adjustments is the loss of the nice chamfer where the old mechanism met with the pen. What we see on the new version is only a slight step where the barrel of the pen and mechanism meet. They are extremely close in diameter, so close in fact that I could have seen Will just make the pen a smidge narrower so they lined up seamlessly. These are design discussions that don't impact the utility of the pen, but matching those diameters up may have provided a slightly more streamlined look. Alternatively since Will is making the mechanisms himself, the lower half could have been made slightly wider and with the matching texture we see now along the whole barrel. An additional change just referenced is the move to have the Tactile Turn "texture" (subtle spiral grip) along the entire barrel of both the grip and barrel section, similar to what he has done with his other recent products, the Gist fountain and Slider/Glider bolt pens. Personally, I like this approach much better. It unifies his lineup a bit more from a design standpoint, but also has utility by making the pens easier to hold. Oddly, his first desk pen and X, Y, and Z pens had texture along the whole barrel. The original Mover and Shaker pens were the odd ones out! I've owned one of Will's pens almost since the beginning when I bought a "Z" pen back in 2013 and I've really enjoyed seeing him perfect his craft. The quality of his goods, and just the tightness of everything has gone up over the years with each new model. I love seeing this as it shows progression and is maybe even a bit unique in the world of products we buy day to day. It makes us remember that we are buying from a person that is learning and growing and not merely an "entity". Thinking back to his first projects, I wonder if it took a sense of courage to share his creations with the world, even before he may have considered himself a master of his craft. The clip maintains a nearly identical design to the original being made from sprung steel. They work well, are sturdy, and are more function than form, although they don't distract from the look of the pen. With the mechanism being taller, this pushes the top of the clip down about 1/4" which is a good amount. Although the new pen is pretty much the same length as its predecessor, it sticks out of your pocket a bit more. The new models are available in the suite of materials Will generally offers like copper, brass, titanium, stainless steel, and aluminum. Will was kind enough to send me one of the Shakers (shorter version) in the titanium, and the Mover (longer version) in blue anodized aluminum. It was nice to have the length vs weight comparison side by side for the review. The Ti Shaker comes in at about 1.1oz, while the longer Al Mover is only 0.9oz. I think I prefer the slight heft to size ratio of the Shaker, but I was surprised by how airy the Mover feels in the hand. Solid, but quite light. The Shaker comes with the Easy Flow 9000, one of my favorite Parker refills, but can now also accept the popular P8126 rollerball (which I swapped into mine) which is a major plus. The Mover comes fitted with the 0.38mm Pilot G2 refill, a great refill for small letter writers, but a wide variety of refills can be swapped in like the Pilot Juice, or the Pilot Precise V7 which I loaded into mine. While writing, not sure why but the Mover tends to have a little more tip movement (although minimal...) than the Shaker. Perhaps this is due to the spring being used. I am fairly sensitive to this and can say that even though there is some movement, it isn't on the offensive end of the spectrum. With some pens it is like you're broadcasting morse code with the amount of "clicking" the tip does... Not in the case of the Mover and Shaker. These are definitely Mover and Shaker 2.0 versions. Really, with the myriad of changes Tactile Turn introduced, it could potentially be a new pen! Nonetheless, I think the new additions will serve Will's fans and new customers alike well. 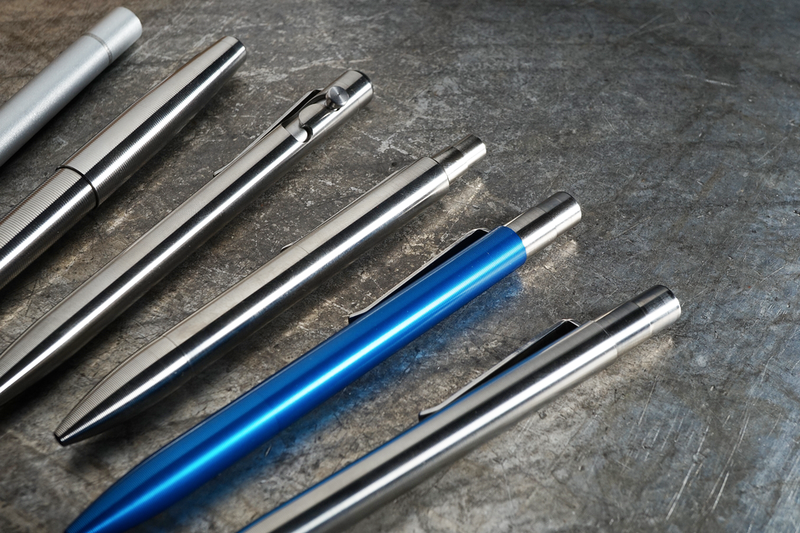 They range in price from about $50-80 depending on your material choice, but are well in-line with the normal going rates in the machined pens market. These new pens can be found and backed on Will's current Kickstarter campaign that runs through November. Special thanks to Tactile Turn for sending these samples for review!